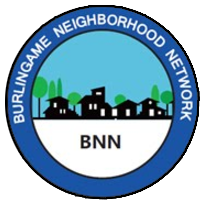 A total of 180 Burlingame residents participated in the Citywide Emergency Drill on October 22, which was organized by the Burlingame Neighborhood Network (BNN) with support from local HAM radio operators, CERTs, the Central County Fire Department (CCFD) and the Burlingame Police Department. The exercise was far bigger than the previous year’s. During the 90-minute exercise, groups canvassed blocks in 10 neighborhoods, looking for emergency “incidents” such as fires or gas leaks that were attached to small flags on lawns. Firefighters and police personnel stopped by as part of the drill and also answered questions. Vice Mayor Ricardo Ortiz, Council Member Emily Beach and City Manager Lisa Goldman also paid visits. People walking by Pershing Park couldn’t help asking, “What’s going on?” and, learning of the drill, expressed eagerness in participating next time. On Montero Avenue, neighbors decided to work together to stock a container with emergency supplies. Over on Sanchez Avenue, drill participants said they’d like to map out all the groups in their area in order to better coordinate an emergency response. Many residents vowed to take CERT and HAM radio training.